What a whirlwind of a few days it has been. It took me a full day to settle back down after the adrenaline-pumping rescue of the Common Loon off Duck Lake. Just for the record, this bird is correctly called a Common Loon, but the term bugs me every time I write it. There is nothing common about the Common Loon. It is just a name some ornithologist came up with a gazillion years ago when they thought the world was filled with loons. Once named, most names stick unless changed through some strenuous paperwork nightmares. So, Duck Lake is a Common Loon. We will call him "Duckie". This will be an abbreviated update as we are working fast and furious to get "Duckie" back into the best shape so he can make a trip to the Gulf of Mexico. Common Loons do not do well in captivity. The Duck Lake loon is an older bird. He is missing his mate, so the stress level is already high. The mate waited with him on the lake until weeks ago when she had to leave to save herself. He was very close to dying as the lake froze over. Eagles were often seen on the edge of his little opening in the ice waiting for him to become so weak or tired that they could make a dinner of him. All those things take a toll and add to his stress. 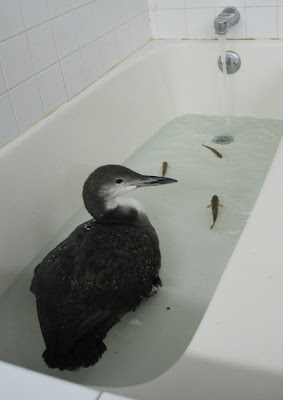 Aspergillosis is a fungal infection that occurs in loons and some other avian species in high stress situations. He has been on medication for aspergillosis since the day he arrived, and will be until the day he dips his fine feet in the Gulf of Mexico. There is some VERY good news for "Duckie," however. He is one of the only loons I have had in years that did not have an elevated blood lead level. In fact, his lead level was so low it was hardly worth considering as a background level of lead. The lake association of Duck Lake are to be congratulated. They must be doing a great job of keeping lead sinkers and jigs off the lake. Here are the stats on "Duckie" as of today. He weighs 8.3 lbs. A male should weigh 10-11 lbs. He likely was unable to eat once iced into the small area. We did blood work on "Duckie". He is anemic, but not dramatically so. That is not great news, but it is something we can fix. This afternoon he will be given an iron dextran injection to hurry his blood-making ability. His anemia is probably the result of not being able to eat for several days. He has a high blood total protein. That goes along with some kind of inflammation. In "Duckie's" case it is likely from the previous wing injury. We will put him on some antibiotics a few days before he leaves Antigo IF the level continues to be high. There is no obvious infection in the injury site. Antibiotics lower the natural immune system and that is not what we want for "Duckie". 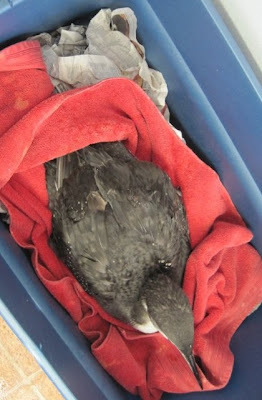 ( Photo: "Duckie" in the container he rests in when not in the water. Note, he sits high off the bottom of the container. The photo below shows you why. You can see tightly balled up newspaper about 6 inches deep to provide cushioning for the loon's keel. Loons are built like boats. They cannot rest flat on their abdomen. On a flat surface they would list to one side, exactly like a boat. The keel is fragile. The skin covering it can be scraped or cut particularly in a thin loon like "Duckie". If that happens, the loon is no longer waterproof or "cold proof". He would die of exposure even in mild water if the skin/fat on his abdomen was breeched and could no longer protect him. Other patients continue to be admitted to REGI. 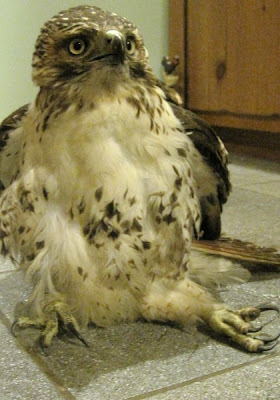 One of the latest was a male Red-tailed Hawk that was caught in a leg-hold trap. 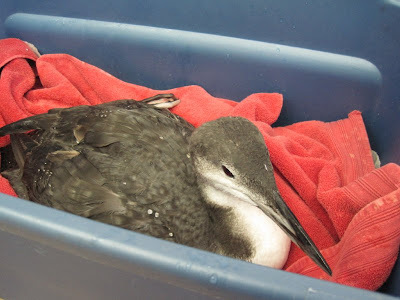 The bird was likely released from the trap but due to his severely broken leg was unable to hunt for himself and was found starving in a field. He will not be able to be released to the wild. We were hit by a huge snowstorm yesterday. It is beautiful, but we are working hard to dig out of the large amount of snow. If anyone out there has a plow and the desire, we would appreciate the help.